700 Inline Twin 4-Stroke with EFI 60+ Horsepower: Modern technology brings you more horsepower, less weight, improved efficiency and long-lasting durability. This all-new Arctic Cat-designed 700 inline twin features EFI, 4 valves per cylinder and liquid cooling. 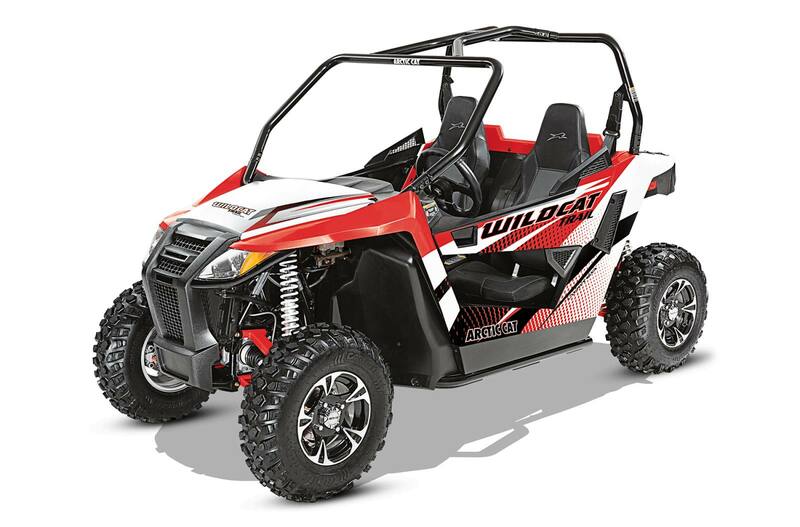 This next-generation 60+ horsepower engine was designed specifically for the Wildcat Sport and Trail chassis. At over 6 HP/100 lbs. power-to-weight ratio, the Wildcat Trail is one of the toughest ones to beat. FOX Shock Double A-Arm Suspension with Anti-Sway Bar: Big power requires a suspension to match. The Wildcat Trail gets double a-arms front and rear sporting FOX® shocks all the way around. Power Sport Digital Gauge: Precise readings of the information you need to run wild. The digital gauge features all the essential operation information indicators: RPMs, speedometer, trip mileage, gear indicator, digital clock and fuel indicator. Carlisle Trail Pro Tires with Aluminum Wheels: Confidence belongs to those with a premium set of tires. Get a load of these rugged Carlisle® Trail Pro 4-ply tires, designed exclusively for the Wildcat Trail and Sport. TEAM® Rapid Response Clutch: True to its namesake, your wheels respond without hesitation - delivering 60-plus horsepower to the ground. In 2WD nothing's more fun than kicking the back end loose as you power steer through corners. This clutching system is ultra-responsive and super smooth. Plus, it's built to handle just about anything. Electronic Power Steering (EPS): Thanks to variable assist electronic power steering (EPS) which activates automatically at the moment of ignition, steering your machine requires minimal effort even at rock crawling slow speeds. Infinitely Adjustable Tilt Steering: Our adjustable tilt steering allows the rider to put the steering wheel exactly where they want to provide the most comfort and confidence. Bucket Seats: Standard on all Wildcat Sport and Trail models, these high-back bucket seats provide comfort for the duration of your excursion while providing an aggressive feel. 2-Inch Receiver: Need to pull up to 1,500 lbs. around? Not a problem. Pull your receiver out of your truck, place it in the 2-inch receiver on your Wildcat and back up to that trailer. 2WD/4WD with Electric Front Differential Lock: Stay in control, whatever the terrain. With the flip of a switch, power is delivered to both the rear and front wheels via the open front differential. In 4WD steering remains light. When you need maximum traction flip the switch again to lock the front differential. 300 lb. Box Capacity with Tie Down Hooks: When you travel far and wide, you often need to bring supplies. The rear cargo box carries up to 300-lbs. of whatever you need to get where you're going. Passenger Handholds: Hang on for the ride of your life. Yeah, there's a handhold. And it's right where you want it to be. 50 Inches Wide: At 50 inches, this machine qualifies for most class I trails. Don't let the narrow width throw you though. With a riding position 3-inches lower than the competition, it will handle like a wider machine. Automotive-Style Paint: After you're done covering it in dirt, it's nice to know you can hose it off and have it look pretty as new. That's the advantage of automotive-style paint. Front Suspension / Travel: Double A-Arm / 10 in. Rear Suspension / Travel: Double A-Arm / 10.5 in. Overall Size LxWxH: 110.5x50x64.3 in.